Unlike most art exhibitions, this one starts with a prayer. A heavyset 77-year-old woman with girlishly pinned blond hair stands behind a table. An array of colored chalk and oil paints fan out in front of her. She puts her head in her hands and concentrates. Then, to the sound of eerie music, she begins to draw. 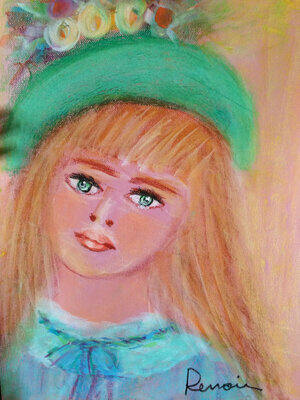 Her hands are nimble and decisive, and very quickly, something begins to take shape: a face with a bright green 19th century hat. 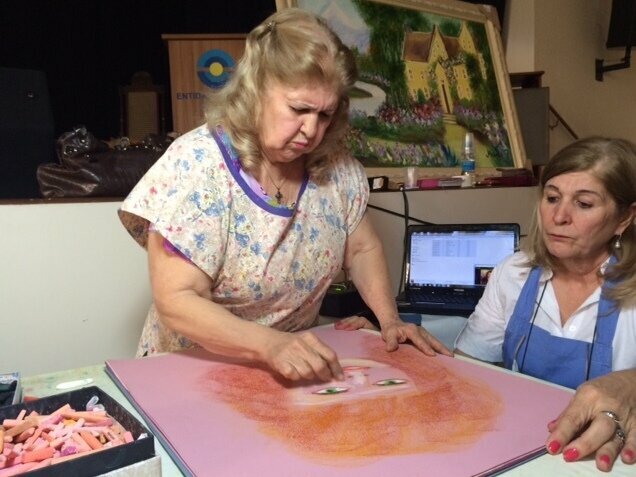 The woman who is painting is actually called Valdelice Da Silva Dias Salum. She tells me spirits began manifesting themselves around her when she was a child. But it wasn’t until years later that it really began to get frightening, kind of like the movie Poltergeist. The TV would suddenly switch on; the radio would blare at full volume. She says the spirits of long-dead painters were trying to make contact: Henri de Toulouse-Lautrec, Henri Matisse, Claude Monet, Renoir, Cezanne, Van Gogh, Gauguin, Degas. Salum says she grew up poor and illiterate. She didn’t even know who these painters were. She says she had no artistic talent. But the spirits selected her. All this might sound odd outside Brazil, but here it is fairly common and widely accepted. Salum follows Spiritism, which is basically a religious offshoot of the 19th century practice of communicating with the dead via table-rapping and seances. Spiritism is hugely popular in Brazil, with more than 4 million followers. Spiritists believe in Jesus’ Gospel, and in reincarnation. They believe that the dead can communicate with the living through mediums — and not only communicate, but create through the living, too. It’s not only paintings that get channeled. At a Spiritist bookstore in downtown Sao Paulo, I’m shown five books — including one by famed Brazilian spiritist Divaldo Franco — that carry Victor Hugo’s name. It’s a Saturday and the place is packed with readers and books. There are more than 220 Spiritist publishing houses in Brazil. One of the star authors is Sandra Guedes Marques Carneiro. Her books have sold more than 250,000 copies. She writes romances — of a kind. Her latest is called Salome, and she tells me she thinks it’s a “sign” that I am interviewing her. The book is about a female journalist who travels to the war-torn Middle East and then comes to Brazil — kind of like me. Carneiro emphasizes that the books are basically religious texts. The spirits are writing to try to bring about enlightenment and understanding to the earth. It makes the message more entertaining if it’s wrapped in a good love story. Her spirit author, for the record, is called Lucius, and he has a huge following — so much so that other author mediums channel him as well. Alexandre Marques edits and publishes the work of his wife, Sandra. He says this part of the publishing industry presents some unique challenges. Another difference from traditional publishing? Editing. Surprisingly, Marques says it’s actually easier to edit a dead author than a living one. Apparently, the dead are less defensive about the integrity of their work. “The spirits are easier going, actually,” he says. Still, it’s a labor-intensive process. It is pretty difficult to get approval for your edits from a spirit. This all gets into some strange legal ground. There was a case in which the widow of a famous dead author sued a medium for royalties because he was supposedly channeling her dead husband’s spirit and writing new blockbusters. We consulted a lawyer who’s an expert in spiritual copyright. Renata Soltanovich says that as long as the consumer who buys the work understands that it’s been channeled through a medium, it’s not fraud. Back at the painting exhibition, Salum is channeling another dead painter. I’m not an art critic, but the paintings, in my opinion, are not ready to be hung in the Louvre. I ask her why her works don’t quite match the standard of some of the originals. She explains it’s hard for the spirits to cross into the corporeal world. In the end, she says, it’s all about faith.